1 photograph : b&w ; 18 x 13 cm. 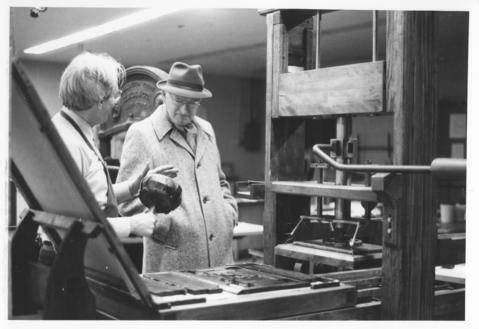 Item is a photograph of Dr. Robert MacGregor Dawson demonstrating how to use the leather-covered balls to spread the ink on the hand press to an unidentified adult. The replica of a 17th century wooden hand press was housed in the Dawson Room of the Killam Memorial Library at Dalhousie University. The replica press was built by two professors: Robert MacGregor Dawson of the Department of English and Fred J. Matthews of the Library School. It is based on blueprints of a press, dating from around 1625, from the Plantin-Moretus Museum in Antwerp. As far as possible the ancient traditions have been followed: the frame is entirely of oak and maple, the joints are all mortised and tenoned and held together with glue and pegs. Screws have been kept to a minimum. Old leather-covered balls are used for spreading ink. The 18 by 25-inch bed of the press is a slab of marble.